You have a great chance to take part in the space race! Cool, yeah?! So, just use arrow keys to move and x to accelerate and beat your opponents as soon as possible! Is everything clear? Then do not waste your time and play this game! Hit the opponents in the side or in the front to eliminate them. Pick up to fill the health bar. Eliminate the opponents to win. 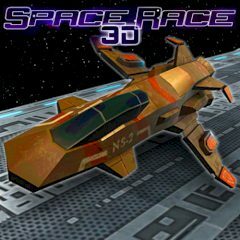 This game propose you to take part in tour and race your way across four planets, each with their own individual race courses and missions, circuit races, take down and time trial are just three of the missions you will undertake on the intergalactic highway race roads and if the racing road is too boring for you, take a risk and skip some course by flying off the highway! Ready? Let's do it now! You will love this game!